Kim’s preference to keep North’s hair slicked back in a tight bun instead of having her hair be natural has reportedly been a source of tension for the couple, with an insider claiming that North’s hair bothers Kim because it “doesn’t fit the vision she has for her daughter.” Kim apparently does not like North’s hair down and wishes that North had straight hair. This statement does not seem far-fetched considering that any picture of North with her naturally curly hair is very rare. 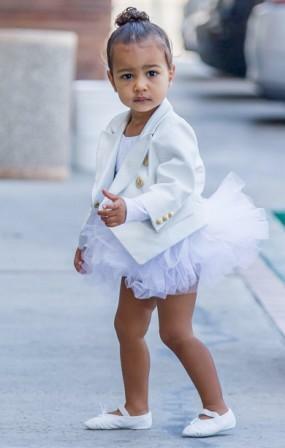 However, North has apparently been complaining about her head hurting and Kanye has since intervened in the matter. Kim is also very particular about North’s outfits, saying, “She doesn’t like pink or purple. She likes greys, creams, oatmeal colors and black. Every once in a while she’ll add in some color, like with her little red Air Yeezys, but other than that she likes to keep it pretty simple.” We didn’t know two-year-olds could be so fashion forward.